There is plenty of lemon flavor in these slightly sweet, cake-like waffles. Their pale yellow color contrasts beautifully with the deep purple blackberries. Fresh berries are best, but frozen or canned may be substituted. 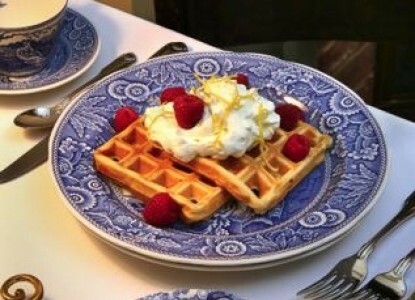 Set out additional lemon-flavored yogurt or unsweetened whipped cream to serve with the waffles. Prepare the topping: Place the blackberries in a medium-size non-reactive bowl. Sprinkle the granulated sugar over them and stir gently to combine. Using a wooden spoon, mash the berries to bring out their juice. Let stand at room temperature until ready to serve. Preheat the oven to 200F. Preheat a waffle iron. In a medium-size bowl, combine the flour, granulated sugar, baking powder, and baking soda. In another medium-size bowl, whisk together the yogurt, milk, eggs, butter, and lemon zest. Pour this mixture into the dry ingredients, stirring to form a smooth batter. Lightly grease or spray the grids of the waffle iron. Follow the manufacturer's instructions, or spoon about 1/3 cup of batter (amount varies with size of iron) into the hot iron and spread it almost to the corners of the grids. Close the lid and bake for 2 to 3 minutes, or until the waffles are golden brown, their edges look dry, and they do not stick to the grids. Transfer the baked waffles to the oven, placing them directly on the rack so they will stay crisp. Transfer the waffles to serving plates and top each serving with the blackberries.